disagreement about the correct course of action in the best interest of a patient occurs. Specific communication skills are required to avoid arguments and to ensure interactions are focused on finding effective solutions both parties can live with. 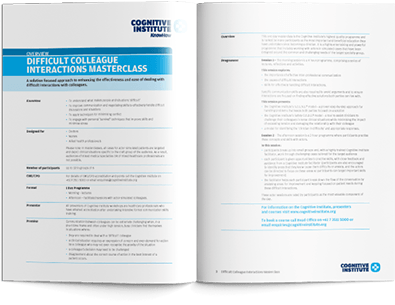 The Difficult Colleague Interactions Masterclass provides participants with an understanding of the importance of effective inter-professional communication, the causes of difficult interactions and practical skills for effectively handling these interactions. 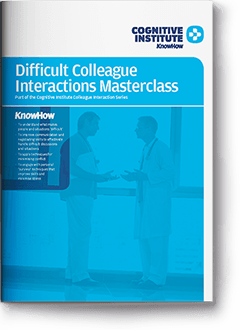 The Difficult Colleague Interactions Masterclass is ideal for doctors, nurses and allied health professionals. engage with personal ‘survival’ techniques that improve skills and minimise stress. Participants will also learn how to use Cognitive Institute’s Safety C.O.D.E.© model, a tool to assist clinicians to challenge their colleagues in tense clinical situations while minimising the impact of escalating tension and damaging the relationship with their colleague. A solution focused approach to enhancing the effectiveness and ease of dealing with difficult interactions with colleagues.